What I like about Tsuru, besides their katsu curry and sustainability credo is their wine list. Emma, one of the 3 owners of Tsuru, is always tweaking the wine list, looking for wine that not only go along with their Japanese hot food and sushi but also follow their commitment to sustainably sourced ingredients. Recently, they’ve gone completely organic/biodynamic, shortening the list to just 3 reds and 3 whites along with a sparkler to complement the dynamic flavours of Japanese food. 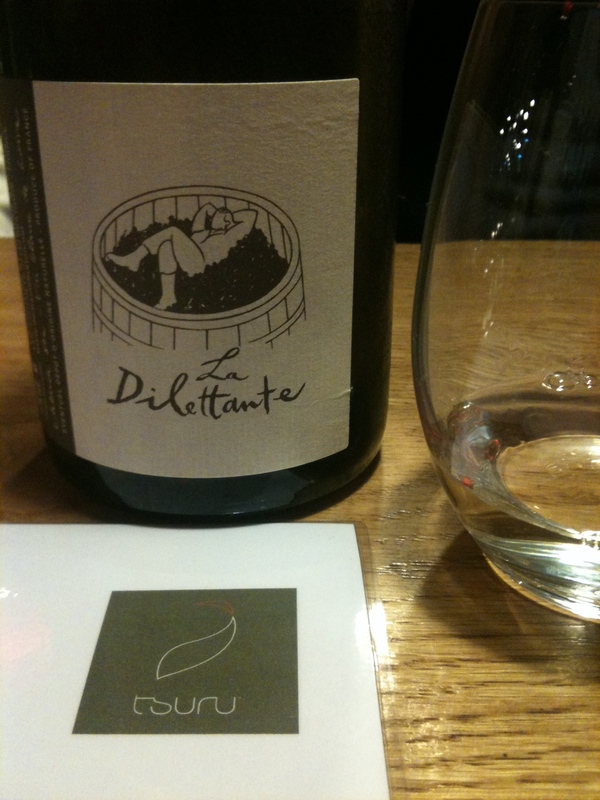 Tsuru uses the wines of the importer Caves de Pyrennes, who specialize in organic, biodynamic and sustainable producers. So what did I think of the wines? While not being overly complex (and there might have even been a natural wine in there somewhere), they did make good matches with the food. 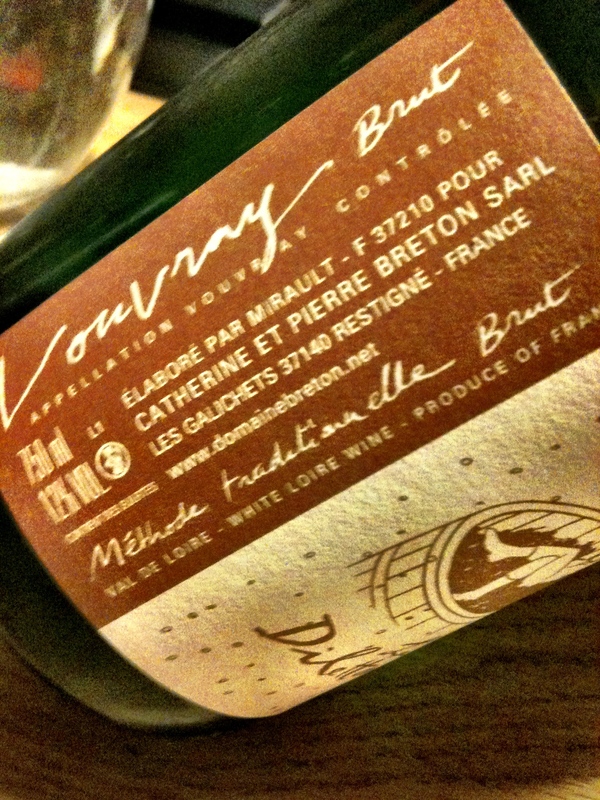 The sparkler is a Vouvray brut, made from chenin blanc but with bubbles, which while having definite fruity notes on the palate displayed nutty, yeasty aromas. The bubbles were big but not distracting and this was a simple fizzy wine which was very easy to drink. Two of the other whites were French, a still chenin blanc, La Dilletante was full of fruity tropical notes but dry with a lime accented finish. 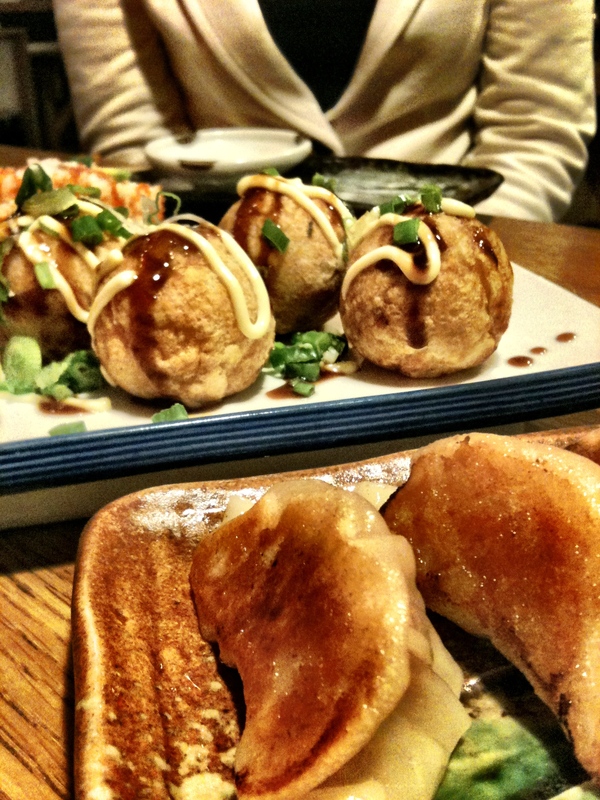 We tried this with the gyoza which was a good match. The 2010 viognier from Reserve de Gassac was my favourite with the tuna sushi, savoury, minerally, and loads of white stone fruit flavours. The third white was a sauvignon blanc from De Martino (Chile), it was typical but nothing special, go for the Gassac if you want a more interesting wine with dinner. Gran Cerdo means Big Pig in Spanish and this fruity tempranillo from Spain is light but not confected, a soft and fruity red wine, it’s really good with pickled ginger. I liked the story behind the wine. Seems the winery owners couldn’t get a loan from the big banks and had to rely on friends and family to start up their winery so in homage to those greedy bankers, they called their wine Big Pig. 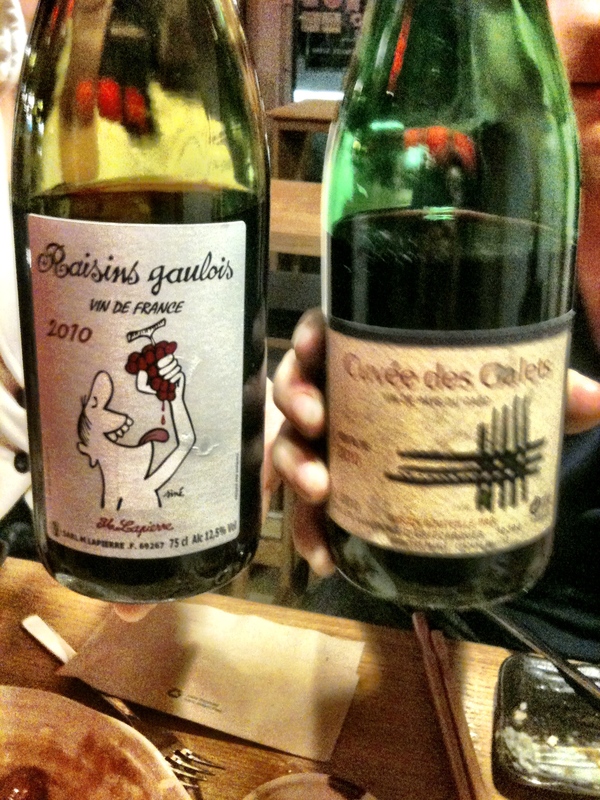 The other two reds were French, the Cuvee des Galets Cote du Rhone 2009, and the cleverly named Raisins Gaulois. Both fresh simple red wines, easy to drink with spicy notes which went down a treat with the octopus balls – not really octopus balls but pieces of octopus in a fluffy potato case. The wine list is compact but Tsuru has an uncomplicated, but tasty menu and the new wines fit into Tsuru’s commitment to sourcing sustainable, quality ingredients, in this case – wine. And, they’re also satisfying additions to the menu.